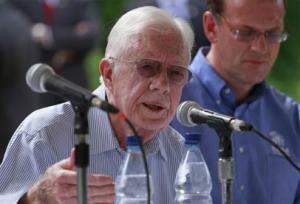 War is only just when it is a "last resort" after "every other possible peaceful resolution" is exhausted, Carter said. Former US President Jimmy Carter warned against a possible war with Iran Monday as he decried his nation's involvement in unjust conflicts at a summit of Nobel Peace Prize laureates in Chicago. 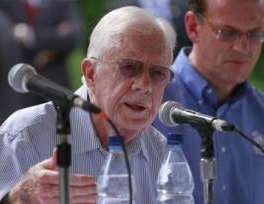 Carter, a naval veteran who served as Democratic president from 1977 to 1981, said that while he is "not against conflict when necessary," the criteria for a just war are often not met. War is only just when it is a "last resort" after "every other possible peaceful resolution" is exhausted, when all efforts are made to protect civilians, when the purpose of the conflict is to make the situation better, not worse, when society in general agrees it is just and when the level of violence is "proportional to the injury received," he said. "That would obviously exclude our recent policy of preemptive war," Carter said in a keynote address. The United States has been "almost constantly at war" in the past 60 years -- in Korea, Vietnam, Cambodia, El Salvador, Libya, Panama, Haiti, Yugoslavia, Iraq, Afghanistan and many others. "And now we are contemplating going to war again perhaps in Iran," said the 2002 Nobel Peace Prize winner. Most of those wars fail to meet the criteria for a just war and "some of them were completely unnecessary." Carter said he wished the United States could be seen as a champion of peace, an environmental leader, and the world's most generous nation when it comes to feeding the hungry and opposing human rights abuses. "That's not a hopeless dream," Carter said. "Maybe for my generation, yes, maybe for my children's generation yes, but not for my grandchildren and students who are looking at Nobel laureates and saying what can I do to make this world more peaceful and make sure that all aspects of human rights prevail." Carter, who suffered from a perception of weakness that culminated in the botched 1980 operation to resolve the Iranian hostage crisis, is among 20 laureates gathered in Chicago for a world summit of Nobel Peace Prize winners.